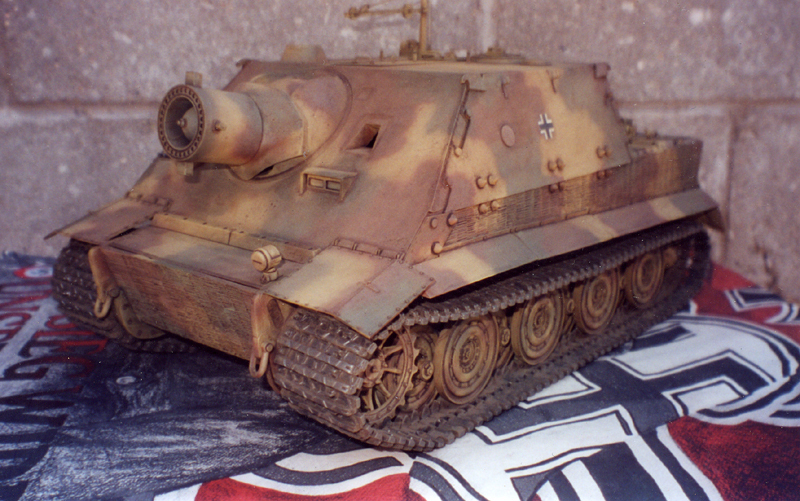 PANZERMORSER 38 STURMTIGER IN 1/15 SCALE. The Sturmtiger was a fierce destructive mean fighting machine, it was an extremely powerful, potent and fearsome weapon. This armored fighting vehicle was armed with an RW 61 mortar-projector rocket launcher which had a caliber of 38cm of enormous demolishing power. The first Sturmtigers were committed to the street fighting against polish rebels during the Warsaw uprising in August 1944 and instantly destroyed a large number of enemy-occupied buildings with single rockets which immediately brought the uprising to an abrupt halt!. High-angle fire from these heavy weapons inflicted major damage on enemy artillery and infantry positions. Allied forces in the sector which came under fire from a Sturmtiger were paralyzed for several hours after being hit by this weapon, it spread terror and confusion among the enemy. The 38cm 4581 rocket high-explosive shells fired by the RW 61rocket projector had a length of 1.54 meters and weighed 350 kilograms of which 125 kilograms was the explosive charge. The rockets were dangerous weapons whose effect on morale--especially at night--was enormous. For several seconds following impact the sky became fire-red, the shockwave followed seconds later and then an ear-shattering thunderclap. The effect in the target area was so paralyzing that the enemy required hours to recover from the shock. Each Sturmtiger could carry thirteen rockets which constituted a considerable amount of firepower. Thus, the Sturmtiger was a rocket-firing new war machine development which was as cruel as it was effective.